These Pea fritters are the perfect little bite. 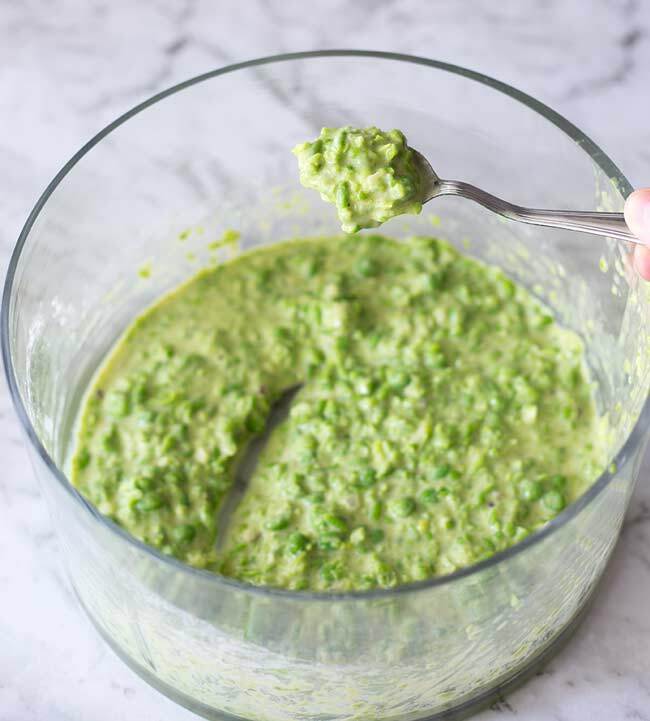 Packed with pea flavor, quick to make, easy to eat plus they can be made in advance and kept in the fridge for 2 days or the freezer for 3 months! The goats cheese cream is the salty foil to the peas natural sweetness, and everything just tastes out of this world good together! Four friends sat on a picnic table, catching up as the kids run off steam. School is out for the summer and this will be your Monday mornings for the next couple of months. Sat catching up over travel cups of coffee and store bought muffins. Nothing wrong with that, but today you thought you’d treat your friends. You have a ziplock bag of pea fritters, prepped over the weekend and then frozen until needed. Bright kermit green from the peas and fried to a crisp golden exterior. The colour is intoxicating, so vibrant, so full of summer and there is no mistaking the peas in these fritters. To spread on top, a small pot of goats cheese cream, pre-mixed with a little red onion and dill. Mixed together to a creamy delicious finish and so easy for your impromptu park party. What could be better for morning tea than pea fritters with goats cheese cream? You smile because you know the answer, Pea fritter with goats cheese cream and a sneaky mimosa! You have a bottle of bubbly and freshly squeezed orange juice in the insulated cooler. Now that is how to start a Monday during the school holidays. Can you make pea fritters in advance? You sure can! I have made these fritters and kept them in the fridge for 2 days, plus I tested them out in the freezer and they defrost wonderfully and taste just as fresh! To keep refrigerated I popped them into a airtight tupperware container. To freeze I placed them in a zip lock bag and lay it flat in the freezer. Laying them flat also meant they defrosted nice and quickly! For my brunch with the girls, I got them out in the morning around 9am and they were fully defrosted and at room temp by 11am. I like to bring them to room temperature before serving as the fresh taste of peas is so much better. Just top them with the goats cheese cream before serving. On the photos I kind of crumbled all the ingredients together for the topping, but when I took them for brunch I found it much easier to mix everything together so I only had one little pot to carry. 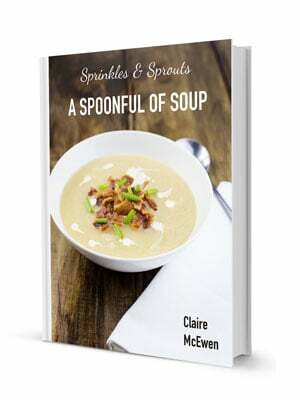 Plus it makes it much easier to top the pea fritters! Do I need pea puree for pea fritters? Not at all, you can see from the bowl above that some of my peas are pretty chunky still. That is just the way I like it. It gives them great texture. The mixture is a little wetter than some fritter mixtures, but they firm up on once cooked. The spoonful of mixture above fell off the spoon as soon as I tipped it upside down and the mixture in the bowl moved to fill the scrape mark pretty quickly. Can I use frozen peas for these pea fritters? That is a big fat YES! That is the beauty of these little fritters, frozen peas are perfect! I cooked mine for 3 minutes to defrost and soften them and then plunged them into iced water. This stopped them cooking and kept the amazing color. p.s for other treats to take for you mum park picnic, try my stay green guacamole (you can prepare it ahead of time!) and some smoked fish tartlets. Or for something more substantial (which justifies another mimosa) why not try this Pear and Goat Cheese Tart from Kathy over at Lemon Blossom. Seriously it is to DIE FOR DELICIOUS!!!!! Cook the frozen peas in boiling water for 3 minutes then drain and plunge into the iced water until cold. Put the roughly chopped 1/2 red onion into the food processor and pulse until it is chopped. Add the drain cooled peas and pulse chop until you have a nubbly mixture. Add in the egg, milk and fresh dill then pulse again until mixed. You want the peas to still have some texture. In a mixing bowl mix the flour, baking powder and salt together. Add the wet ingredients and stir together to make a wet batter. Heat the oil in a large heavy fry pan, then fry teaspoon amounts of the mixture until golden and set around the edges, flip and cook for a further minute. Remove the first lot of fritters to a plate and repeat until all the mixture has been used up. 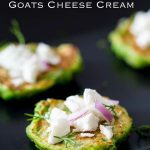 Mix the sour cream and goats cheese together until you have a smooth cream. Add in the chopped onions nd fresh dill and stir to combine. Allow the fritters to cool (room temp is perfect) then top with a small teaspoon of the goats cheese cream. 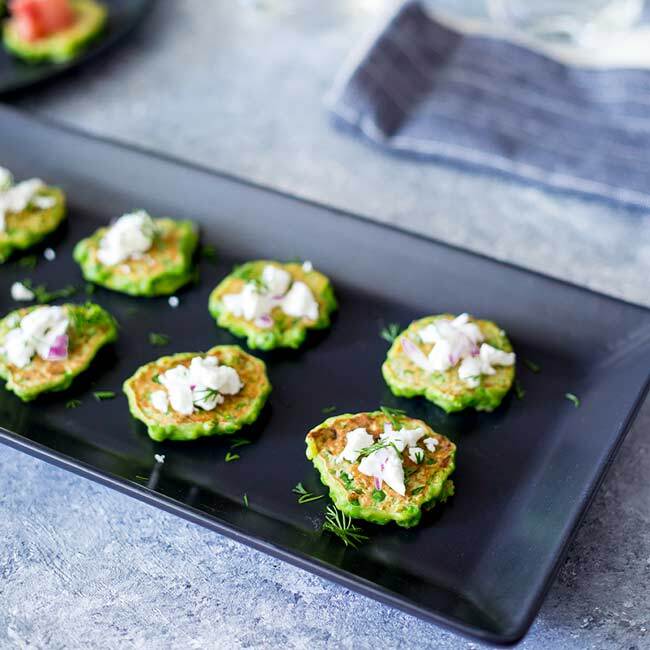 To keep refrigerated, cook the pea fritters as per the instructions then once they have cooled popped them into a airtight tupperware container and keep refrigerated for 2 days. To freeze placed them in a zip lock bag and lay it flat in the freezer. They will keep perfectly for 3 months. In both cases, bring to room temp before serving. 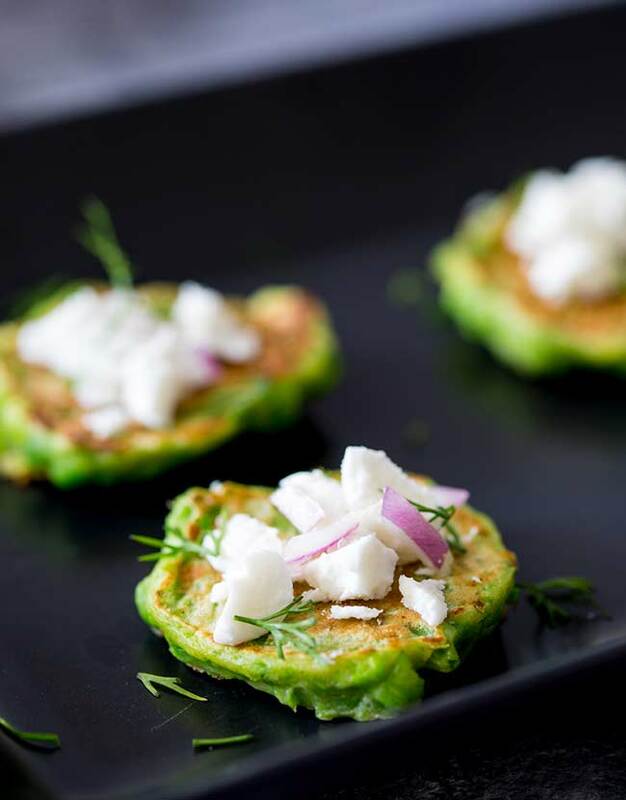 If you love food why not subscribe to my newsletter, I will drop you an email every now and then, just to say hi and send you a couple of recipes think you might love, like these Pea Fritters with Goats Cheese Cream. 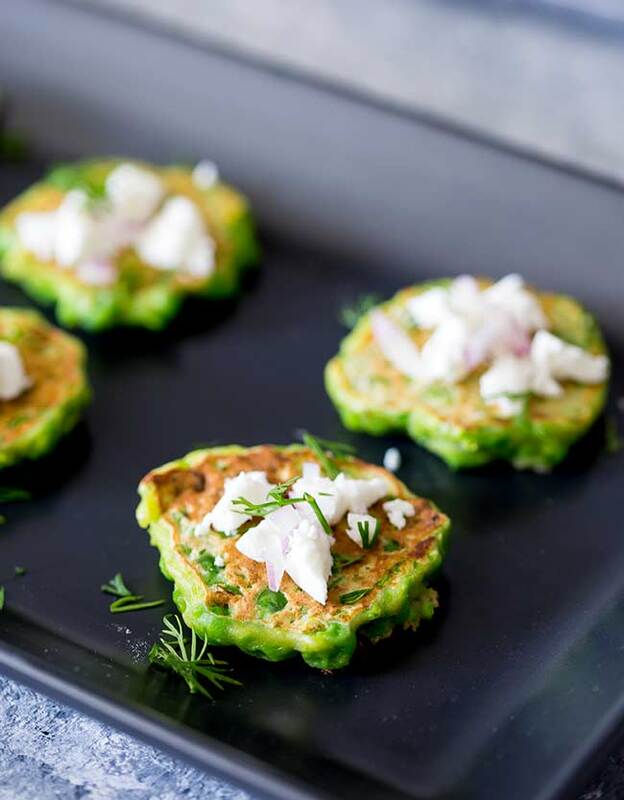 I love zucchini fritters and have never thought of making pea fritters! I can’t wait to try them, they look amazing! Love the sweet peas paired with the tangy salty goat cheese. So yummy! What an amazing flavor combination! Perfect for summer parties. 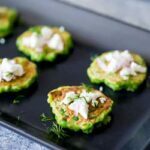 I’m definitely making a batch this weekend as we love pea fritters and together with your goats cheese cream, this will be a winner with my family !